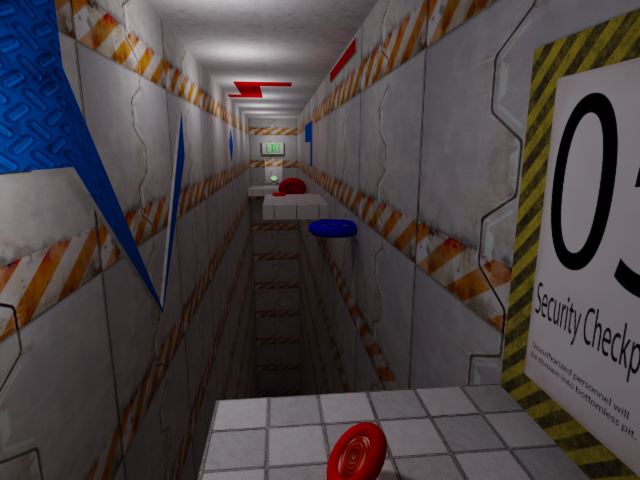 Magnite is a student project, a 3D puzzle-platformer made in Virtools as part of a University Game Development class. The game's core mechanic is magnetics; the player controls a robot that can become positively (red) or negatively (blue) charged and must use this ability to reach the end of each level. A red magnetic field attracts blue objects and repels red objects, and vice-versa. This basic idea is adapted into a number of mechanics, such as clinging to walls, launching missiles and flinging yourself across rooms. Magnite took three months to make, working part-time amidst other University projects. For this project, I was in charge of Game Design and Level Design. I spent most of my time in 3ds Max building levels and testing them to ensure their playability. I also acted as the team's leader and manager: I divvied up tasks and assigned them to team members at the start of each week, giving them clear and concrete goals. I planned for each deadline in the project, communicating with everyone to ensure that the project went smoothly. Magnite was voted the best game of the class and was awarded a prize by Ubisoft. Two videos were made to promote the game, showing level 1 & 2 and level 4.